The Sustainable Jersey Solar Challenge is a friendly competition between New Jersey communities to advance solar adoption through local outreach efforts. The Challenge leverages the EnergySage Solar Marketplace by creating competition between communities, the program helps to motivate cities and towns to get creative about how they promote the program locally. EnergySage offers a host of solar marketing resources so that even communities without staff or volunteers knowledgeable about solar or even about marketing can generate tremendous participation and impact. 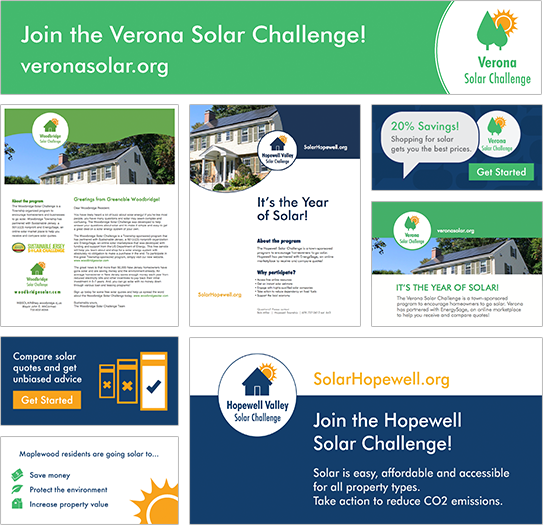 EnergySage created a variety of program materials to support participating municipalities in engaging their residents, beginning with the Solar Challenge program brands. EnergySage's design team crafted a suite of options for each municipality to choose from. EnergySage applied the selected graphic and town colors, producing a unique program brand for each town. All materials, including social media mailers, banners, flyers, social media graphics, postcards and beyond reflected these custom brands. Banners, brochures, letters, and more! This is a section about all the awesome things this program has accomplished! Yay! Go SustJerz! EnergySage runs the original, the largest, and the only truly vendor-neutral solar marketplace. Developed in 2012 with funding from the US Department of Energy, EnergySage is dedicated to information, transparency and choice. Our suite of online tools and resources help consumers research and shop for solar. In addition to making these tools publicly available, EnergySage works with a range of organizations – from corporations like Staples to non-profits like the World Wildlife Fund – to aid their audience in getting started with solar. Would you like to learn more about this or other programs? EnergySage is the partner of choice for municipalities. View our partner overview PDF for more detail about how EnergySage partnerships work. Get a free consultation for your solar program design.